Porsche more than doubled its U.S. sales, largely on the strength of the Panamera four-door sedan. • Porsche had the strongest showing, more than doubling its sales in the United States. 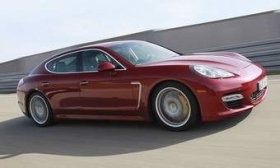 Its advance was helped by a new, V-6 version of the Panamera four-door sedan. •Daimler AG gained 20 percent in June and 18 percent for the first half. A 25 percent June increase at Mercedes-Benz was led by the year-old E-Class sedan and new E-Class coupe. Smart continued to stagger, with sales of the ForTwo micro car down 48 percent for the month and 61 percent for the first half. • Volkswagen's sales of its namesake brand were up 11 percent in June and 30 percent for the first half. Sales were driven by the Golf hatchback and the Jetta sedan. Audi's 14 percent increase for June matched the industry's gain and gave the brand a record 48,440 sales for the first half. Johan de Nysschen, president of Audi of America, said he was "optimistic" Audi would set a U.S. record for the year. "What's holding us back at this juncture is not having enough of the cars in stock to sell," he said. • BMW of North America's 12 percent increase marked its biggest gain for the year, leaving the group 6 percent ahead for the six-month period. "We've been anticipating this month as it welcomed the all-new 5 Series into a market of waiting customers," said Jim O'Donnell, president of BMW of North America, in a statement. Mini brand sales lagged the market with a 1 percent June increase. Roll-Royce sales fell 4 percent in June and the first half. • Volvo reported a 29 percent decline, in large part because of vanishing supplies of the S60 sedan. The redesigned, 2011 S60 goes on sale in September. Year-to-date, sales fell 5 percent. • Jaguar Land Rover North America said combined sales were up 53 percent for the month. Jaguar's 73 percent gain was spurred by the redesigned XJ sedan. Land Rover jumped 44 percent, aided largely by the LR4 SUV, a restyled version of the now defunct LR3. Gary Temple, president of Jaguar Land Rover North America, said the growth came "in the face of a still challenging economy and aggressive competition." • Niche player Maserati said its sales rose 61 percent to 180 cars for the month and 54 percent for the six-month period.